Box turtles are fun, fascinating, and need protection. FOR Volunteer Lauren Morse learned about Woodland box turtles by taking care of Hazel, above. 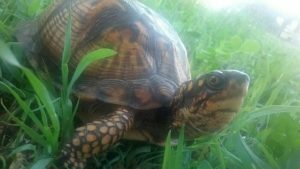 According to the Virginia Herpetological Society, box turtles are a Tier III species of concern with a high conservation need. “Extinction or extirpation is possible, and populations of these species are in decline or have declined to low levels, or are in a restricted range. Management action is needed to stabilize or increase populations.” Hazel was released where she was found in Spotsylvania County, VA. For more info, click HERE. Interesting Facts: Turtles have existed for around 215 million years. Many turtle species are also endangered. Woodland box turtles get their name from their shell, which has a hinge enabling it to close completely, protecting them from predators. For box turtles, the males have red eyes and the females have brown. Box turtles are also the official reptile of North Carolina, Tennessee and Missouri. Physical Appearance: This is about Hazel the Woodland box turtle. Hazel was found in Spotsylvania, VA. By counting the notches on her side, I have estimated her to be about 12 years old. She is bright in color with very noticeable markings on her head. She is about five inches long, from the front of her shell to the back. Diet: Hazel enjoys eating freeze dried crickets, nightcrawlers, grapes, strawberries, bananas, tomatoes, nectarines, and raspberries. She has a very good appetite. Not a big fan of veggies, though. She doesn’t mind being hand-fed. She just loves eating in general. Personality: Hazel is not shy at all. She scratches sometimes. She’s also very alert to sound and movement. She has a lot of energy. She’s very vocal, especially at feeding time. Habitat: Hazel’s habitat consists of dirt, mulch and pine leaves. She also has rocks and logs to climb on. Her habitat includes a water dish to soak in. She loves to move things around and renovate her house. All that work can get pretty noisy! Experience: Having Hazel has been a great experience. She has taught me that some turtles are very social. You wouldn’t think a turtle could move so fast, but they can. They also eat a lot for their size. As cool as turtles are, what’s sad is that is that they’re so hard to find. Avoid mowing tall grass during turtle season. Educate yourself and others about turtles. Don’t relocate turtles, unless moving them off the road. When releasing a turtle, release them in the same spot where they were found.